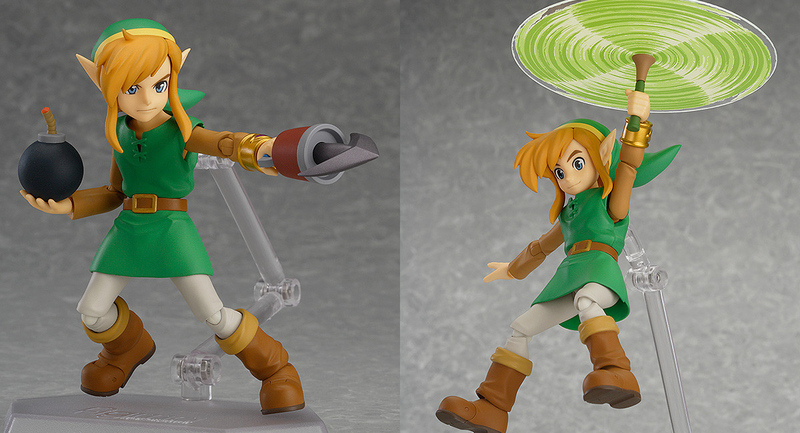 Home Games Check out the Hero of Hyrule with this amazing Link Figma Action-Figure! Check out the Hero of Hyrule with this amazing Link Figma Action-Figure! This awesome fig of our Favorite Hylian Hero, Link, is coming later this year from Max Factory and Good Smile Company and is open for PREORDER NOW! Following up to successful release of Link from The Legend of Zelda: The Skyward Sword (successful enough that it needed a second run) comes another Link figure to look forward to – This time from the hit Nintendo 3DS game, A Link Between Worlds! The Figma brand, to those who are not familiar, is a high-detail and super-posable action-figure line that features mostly anime and videogame characters. This version of Link is the perfect amalgamation of old and new-school, since the character was also based on the 16-bit Super Nintendo game, A Link to the Past, that was released to critical acclaim. Two versions will be available when the figure releases in August. Here’s a look at the standard version. The regular version features Link with the Iconic Master Sword, Hylian Shield, a stand and two facial expressions; Also included is a 2D Version of the protagonist – A wall traversing mechanic that was introduced in the game. Meanwhile, the deluxe version includes all of the stuff mentioned above plus additional accessories like the the fan-favorite Hook-shot, Bomb, Tornado Rod, a Rupee, and a Clay Pot.